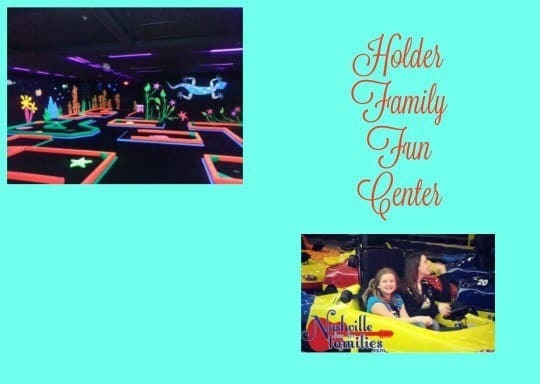 Holder Family Fun Center is a great place for indoor family fun. There are two locations. One in Hendersonville and one in Gallatin. 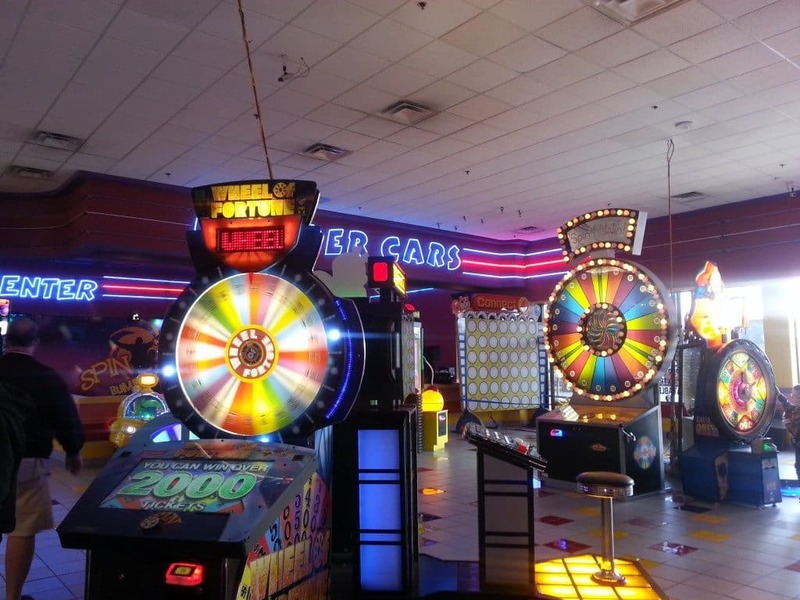 The Gallatin location features a 24 lane bowling alley and a two story Laser Tag arena. We visited the Hendersonville location. This center is divided into two distinct sections. The bowling area is on one side and the ‘game’ area is on the other. 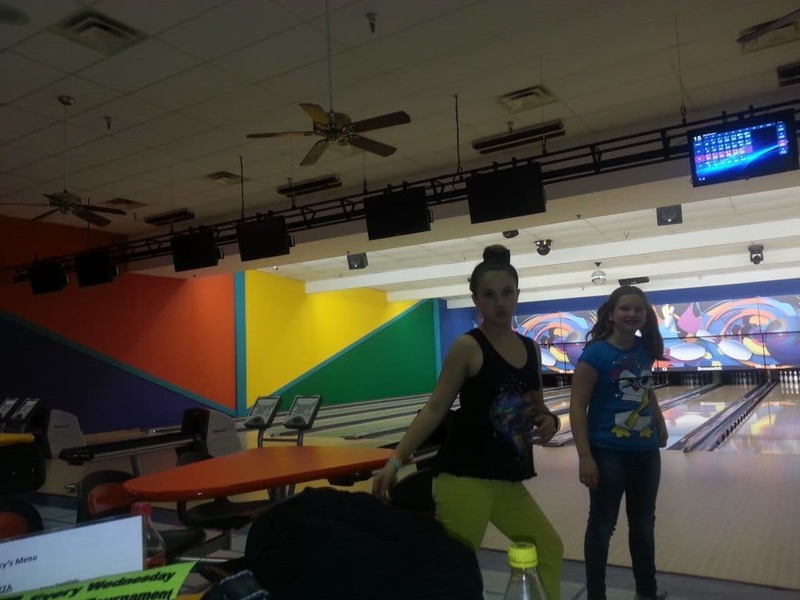 The bowling alley is 28 lanes. It is one of the nicest bowling alleys I have ever been in (and I have been to A LOT of bowling alleys!) The area is well lit and there is tons of seating both for players and spectators. There are lots of specials depending on the day/time. You can find a list here. 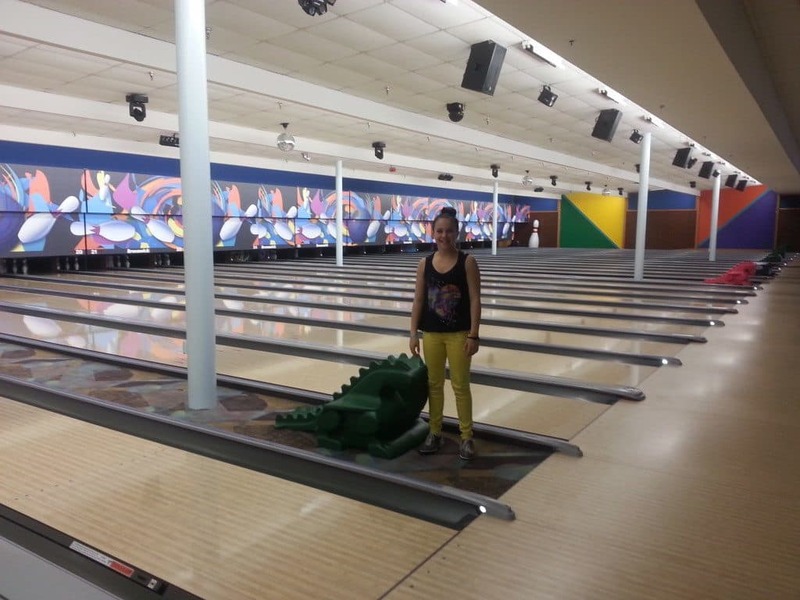 The lanes are equipped with bumpers and a dinosaur ‘helper’ for younger kids. This area also features a concession stand, vending machines, restrooms with changing tables and a large arcade area. The other side of the center has a huge selection of family fun. Each attraction is priced separately. You can purchase a reloadable card for each specific ride. 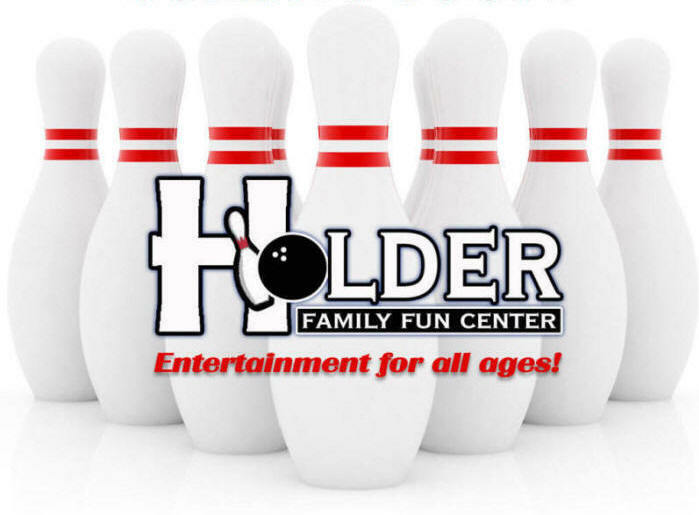 Holder Family Fun center also offers an unlimited fun pass. That will allow you or your child to ride or play in any area as much as you want for that day. If you plan to do any activity more than once (and trust me…your kids are going to want to ride the go-karts multiple times) then the fun pass is a much better value. Take the time to walk around a bit before you make your purchase. If you have a fearful toddler you may be better off buying an individual attraction pass for them. There are height restrictions on some of the attractions so pay attention to those when making your decision. There are lots of arcade style games in this area. These games ‘pay’ out tickets which can be redeemed for prizes. 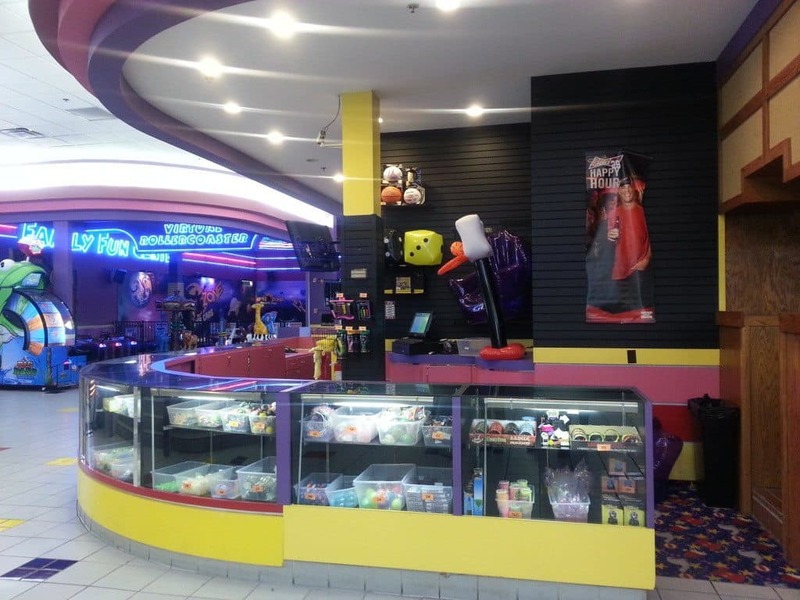 You will also find the bumper cars and laser tag in this front area. Each attraction is staffed by an employee to help get you set up. There is another set of restrooms here between laser tag and the gyrocscope. Toward the back of the center you will find an open lounge area for adults, a large snack bar and an inflatable play area for toddlers. All the way in the back, you will find the indoor glow mini golf. It’s a fun little course that will be easy for your kids (or husband) to play. 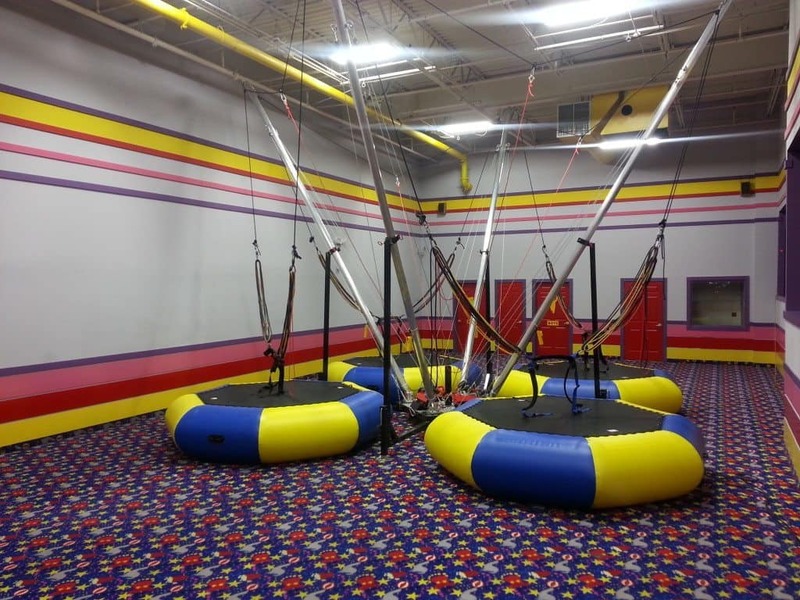 Holder Family Fun Center also offers a large bungee jump area. These are the type you see at festivals and shopping malls where you are harnessed in and bounce on a trampoline. My kids LOVE these. Yours probably will too. As of 2015, they also offer roller skating and a rock climbing wall! For my family, the highlight of our trip was the indoor go-karts. It is a pretty large track but because it is indoors I don’t think it is quite as intimidating as an outdoor track. Plus you never have to worry about the weather! 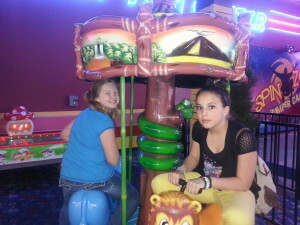 The karts are big enough for two kids to ride. There is at least one employee on the track at all times to help the riders set up and keep the whole deal safe. If you have a kid who loves cars, they are never going to want to leave!